Food blogger Willa Friday is excited to start training her new assistant to make recipes and style food. And she’s excited that her blog, A Dish in Thyme, is finally making enough money to hire an assistant. But she has other obligations too, like the food photography for the annual Whine & Roses Benefit poster. With her (ex)mother-in-law as the prime suspect, Willa reluctantly gets involved in the investigation. In the process, she learns of the many secrets the vineyard owners of Pear, California are hiding, which puts her directly in the killer’s line of fire. Sushi, Sauvignon & Murder is the second book in the Willa Friday Food & Wine Cozy Mysteries series by USA Today bestselling author Jamie Lee Scott. The series takes place in a small town in the Sonoma Valley, wine country. Willa Friday has gotten used to her new assistant who replaced her daughter when she went away to college. Even so, she’s so happy to have her daughter, Tomorrow Friday, home for the college fall holiday. A whole week with her only child. Her ex-mother-in-law has threatened to put Tomorrow (affectionately known as Tommy) to work at the winery, but Willa wants her all to herself. That is until she finds out the real reason Tommy came home for the holiday. Willa’s life is great, other than still living with her ex-husband and refusing to date. Her blog is taking off, and her daughter is home. But connecting with her daughter will take on a whole new meaning when they come across the body of a local boy. Suspects run rampant, and the victim had most recently worked for Willa’s family winery, Vendredi. He hadn’t left on good terms, but did someone at the vineyard or winery really want him dead? 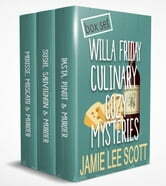 Grab a glass of wine and enjoy this second installment of the Willa Friday Culinary Cozy Mystery series. Recipes and wine pairings are included in the novel. Willa Friday has had her hands full with her daughter and her new assistant. Well, he's not so new, but new enough. She's been starting her days by driving into town for coffee and cupcakes at Bent Fork Bakery & Gifts. And it's starting to show. Over a period of weeks, she's noticed the same man sitting in the same chair each time she comes in. He's usually still there when she leaves. She doesn't think much of it, other than that he should weigh more since he's ordering way more than she does. That is until his regular server, Becca Roundhouse, is found dead in the parking lot behind the bakery. Now Willa is determined to find out who the man is, and if he had anything to do with Becca's murder. As always, Willa will share some of her favorite recipes from A Dish In Thyme food blog.